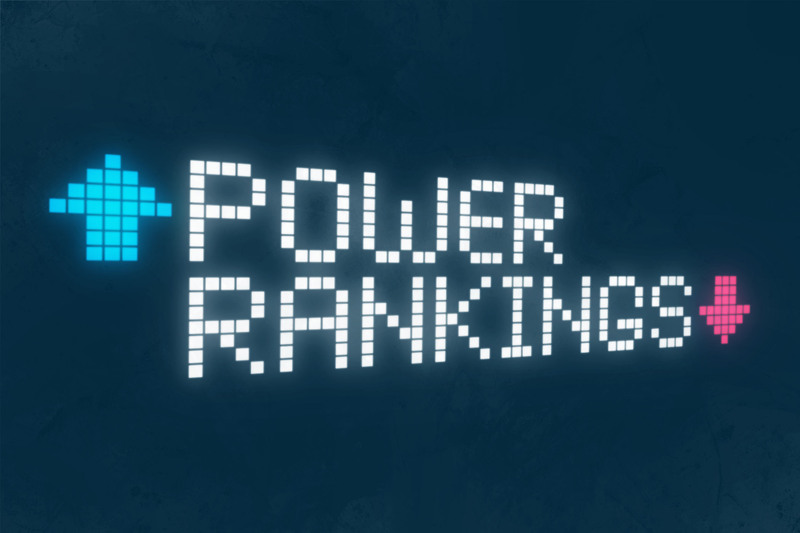 Power Rankings: Week 14 - The Point Data-driven hockey storytelling that gets right to the point. 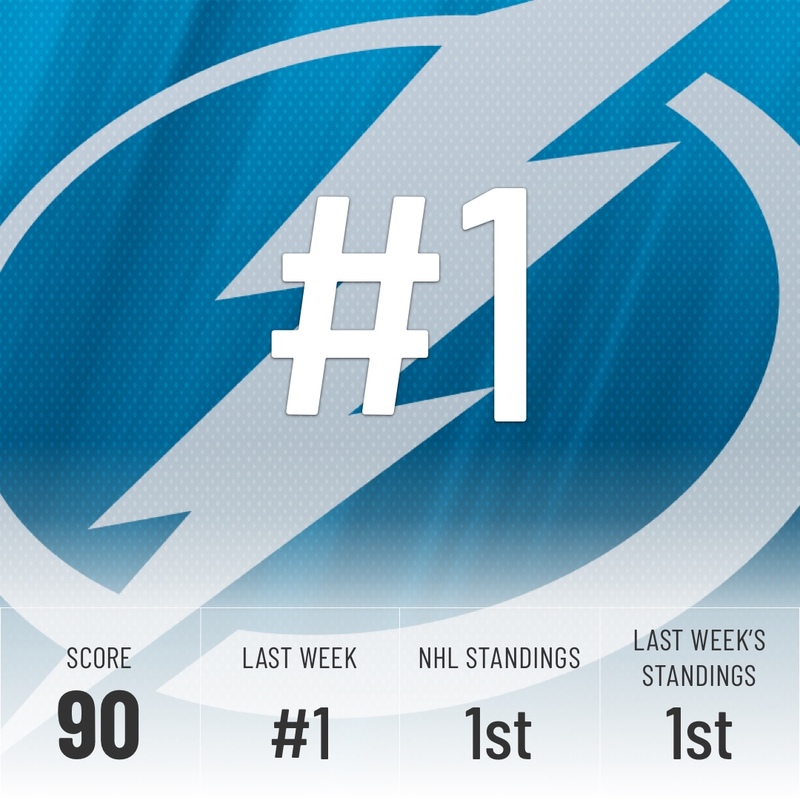 Bad news for those who thought the Lightning were going undefeated the rest of the season. Losing to the Sharks won’t be nearly enough to drop the Lightning out of the top spot. At this point, Tampa just needs to stay healthy and get ready for playoffs. 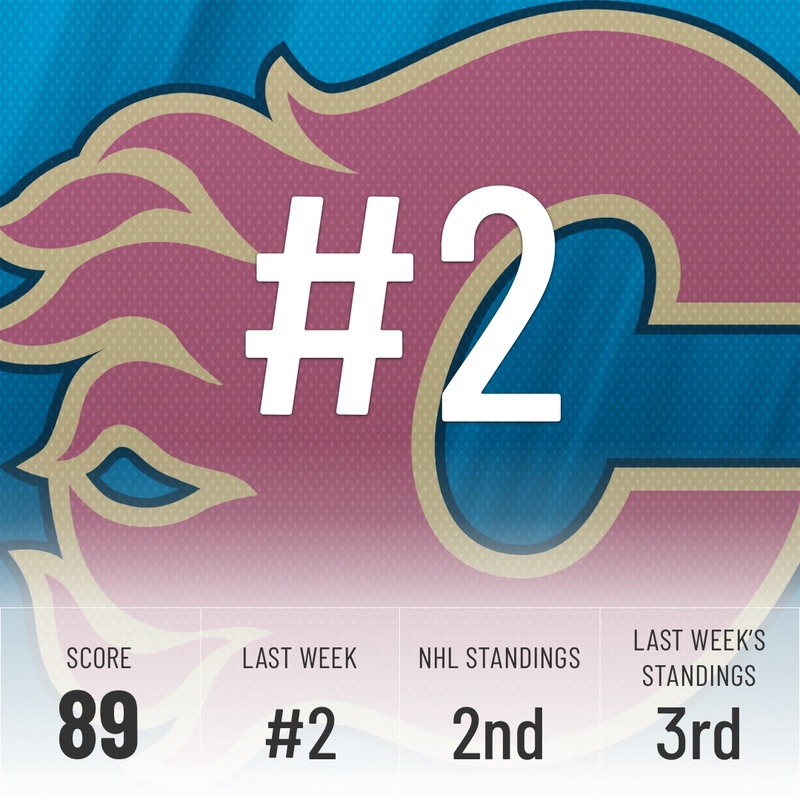 The Flames stand pat at 2nd in our rankings this week. This team is looking more and more like a Stanley Cup contender but will need their goalies to find a rhythm if they want to go deep into the playoffs. The Leafs power play has been struggling as of late with them playing at a .500 rate over their last six games. Nothing to worry about for the Leafs, who’ve been hit with the injury bug recently but it’s been reported that Frederik Andersen should be back on Saturday. He’ll provide a big boost for them and will hopefully get them back on track. Erik Karlsson is on fire right now. He was held without a point last night for the first time since December 5th, a run that saw him tally 25 points in 14 games. 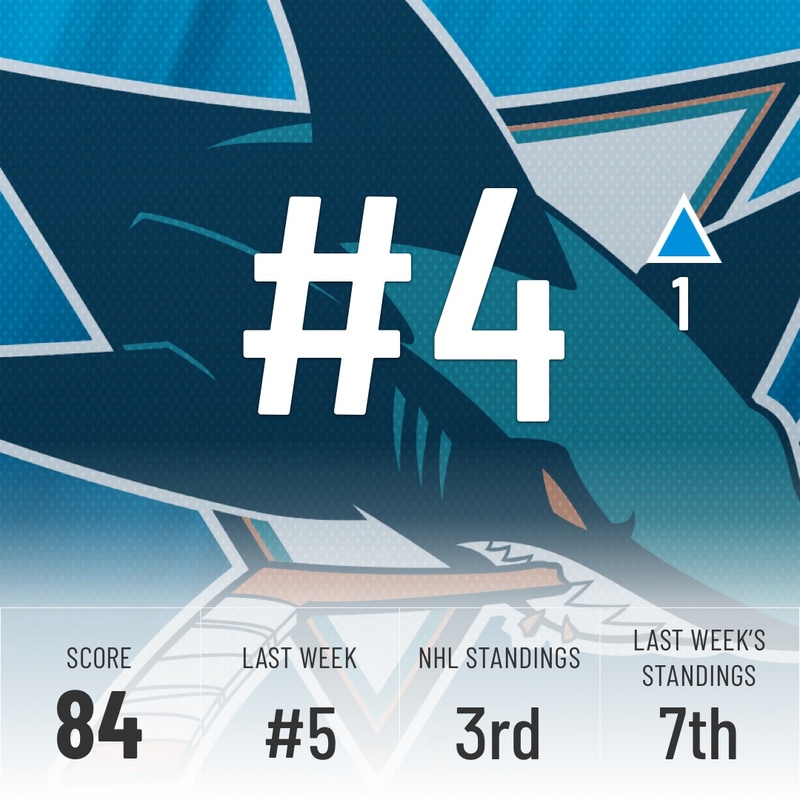 The Sharks have ridden his hot play to catapult themselves up the standings. When Karlsson and Brent Burns are hot, this team becomes really tough to stop. The Predators had a tough start to the week losing to the Red Wings in overtime but have since rebounded knocking off four wins and looking like the dominant team they can be. 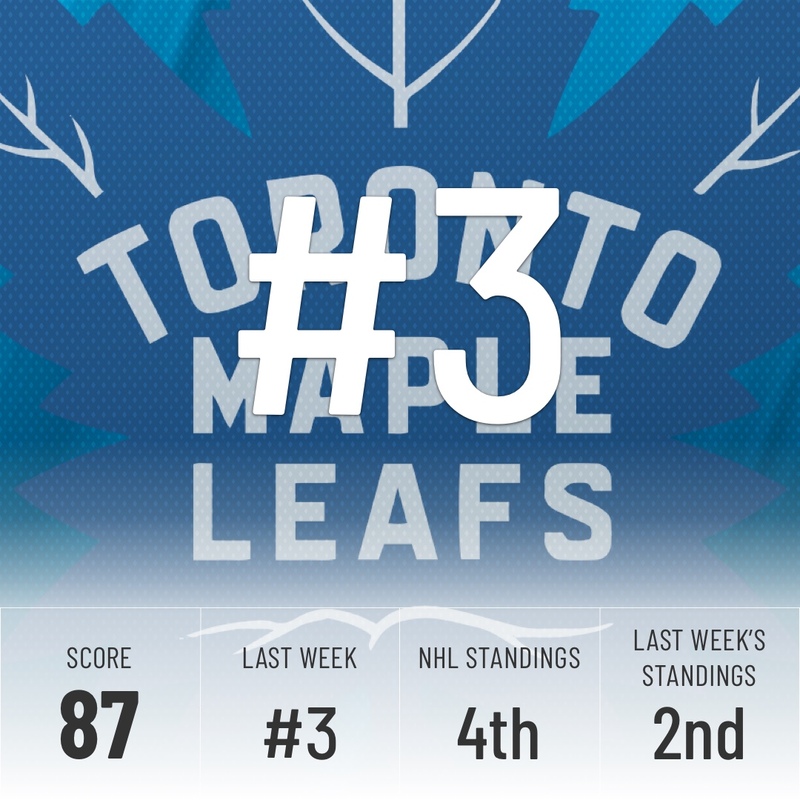 Their thrashing of the Leafs on Monday showed just how good they can be. 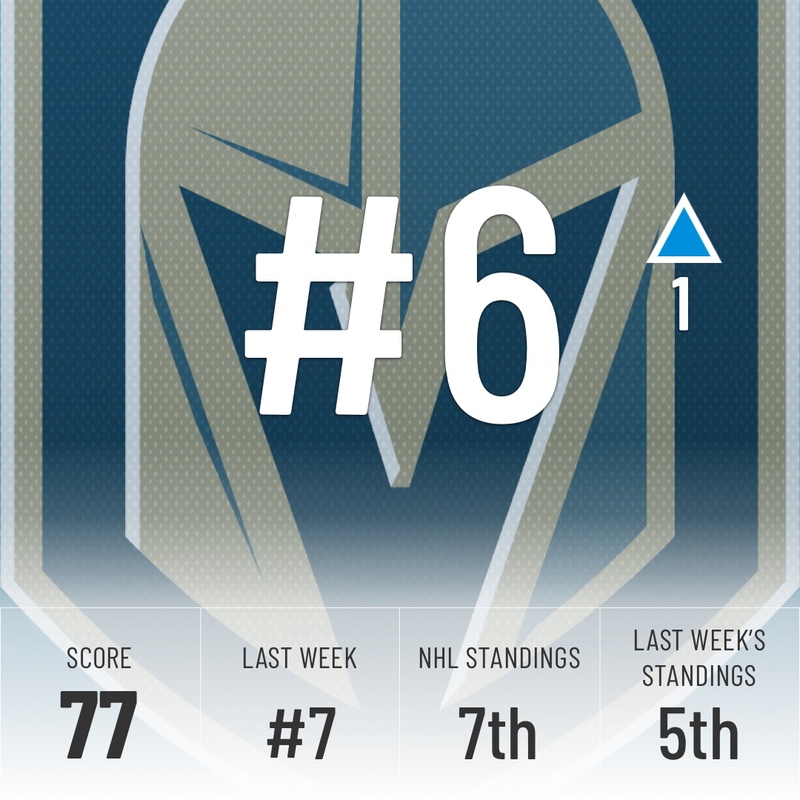 The Sharks snapped the Golden Knights seven-game win streak last night but that doesn’t diminish how well Vegas has been playing. Vegas continues to steadily rise up our rankings with the stellar play of Marc-Andre Fleury. The Penguins had an eight-game win streak snapped by the lowly Blackhawks but rebounded nicely with a dominant win over the Panthers. Pittsburgh’s been finding their groove lately and so has Matt Murray, who has now won eight starts in a row since coming back from an injury. It’s only been enough to keep them competitive since they actually ended up moving down the standings. The Super Computer likes them enough to move them up one spot but it’s being cautiously optimistic. Goal scorers are a streaky bunch and Ovie seemed to be on a cold streak but with 2 goals last night, watch out. If he catches fire again, the rest of the league will be in trouble. His 2-goal night helped the Capitals knock off the Bruins for the 14th straight time. 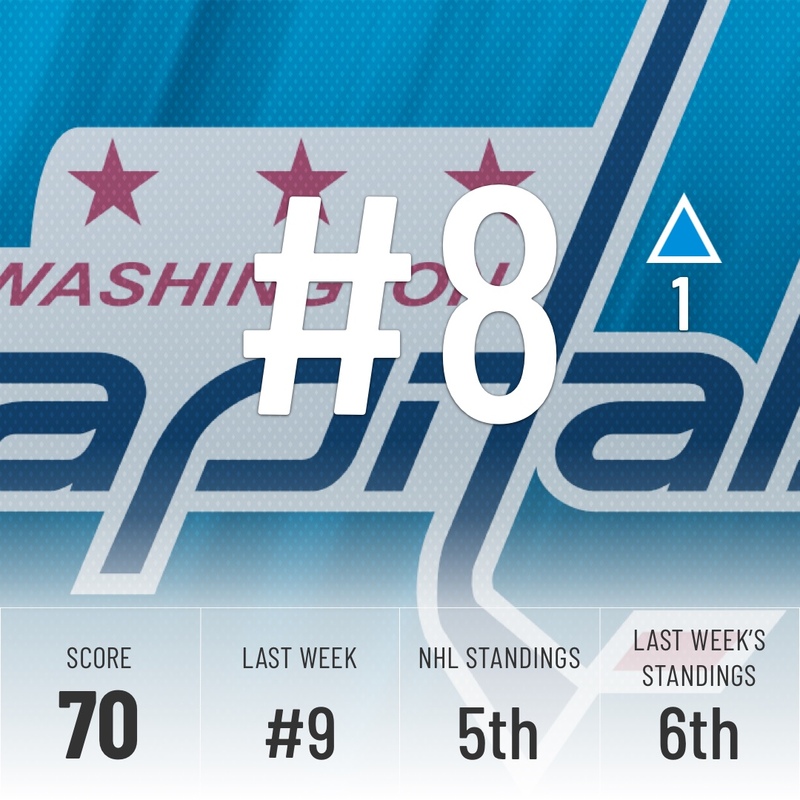 The Bruins are probably hoping they won’t run into the Capitals in playoffs because the Caps clearly have their number. 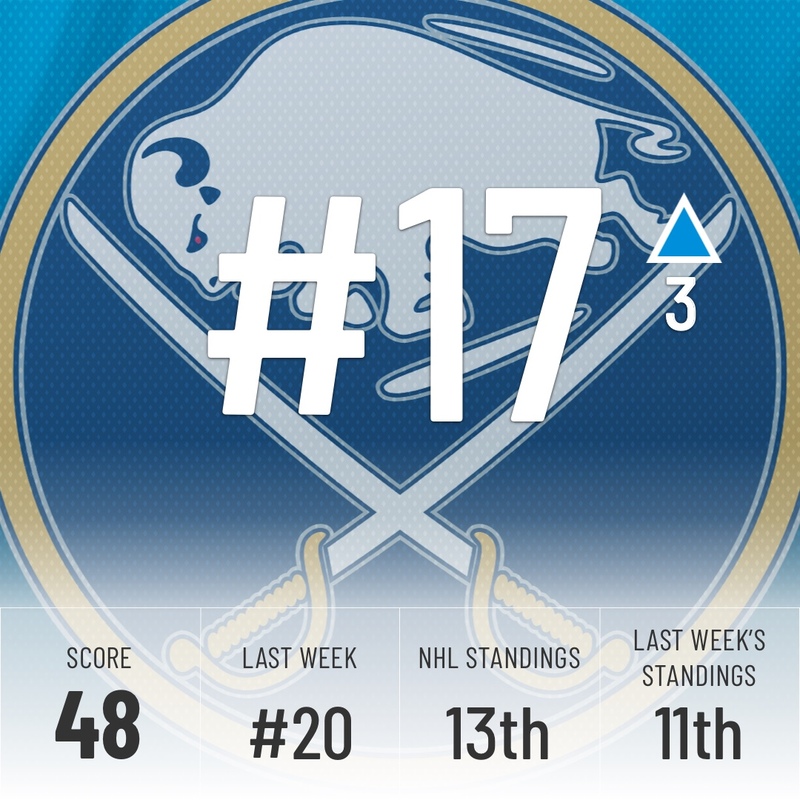 A .500 week dropped the Jets down the league standings and the Super Computer took notice knocking them down five spots. With one goal in their last 11 games, Patrik Laine has been as cold as a goal scorer can get. Getting him back on track will have a huge impact on whether or not the Jets can work their way back to the top of the Central division, especially with Nikolaj Ehlers and Dustin Byfuglien currently injured. 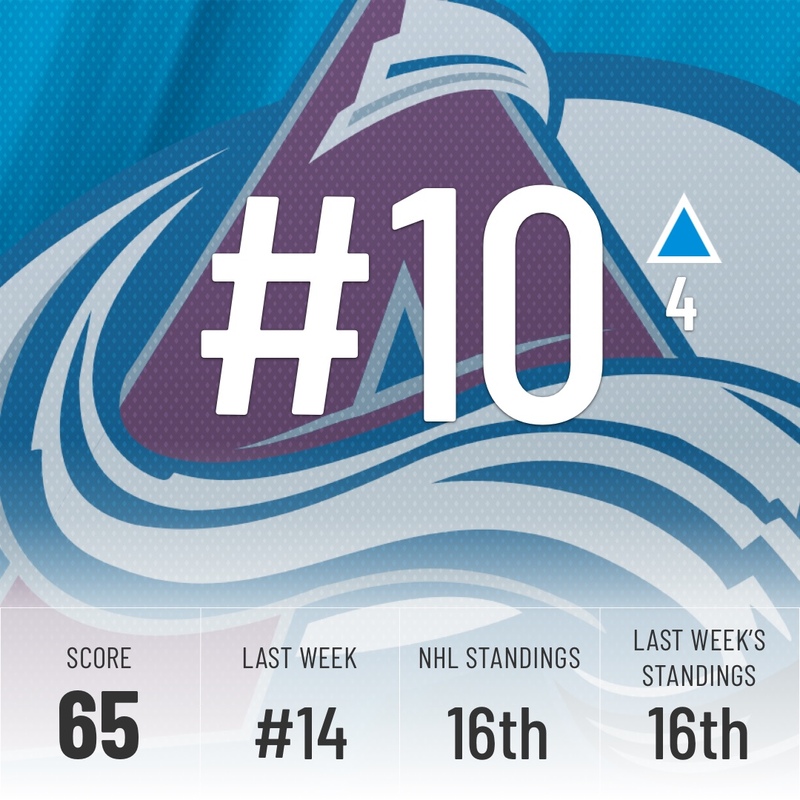 With one win in their last nine games, the Avalanche are in a free fall. Things finally hit their breaking point in Calgary, where Nathan MacKinnon and coach Jared Bednar were caught on camera having a screaming match with each other. Their top line continues to be one of the most dominant lines in the league, if not the most dominant, but they need to get contributions from other parts of their lineup. In the end, the Super Computer decided to make a market correction on dropping the Avs so far down last week but it’s still not very confident in them. 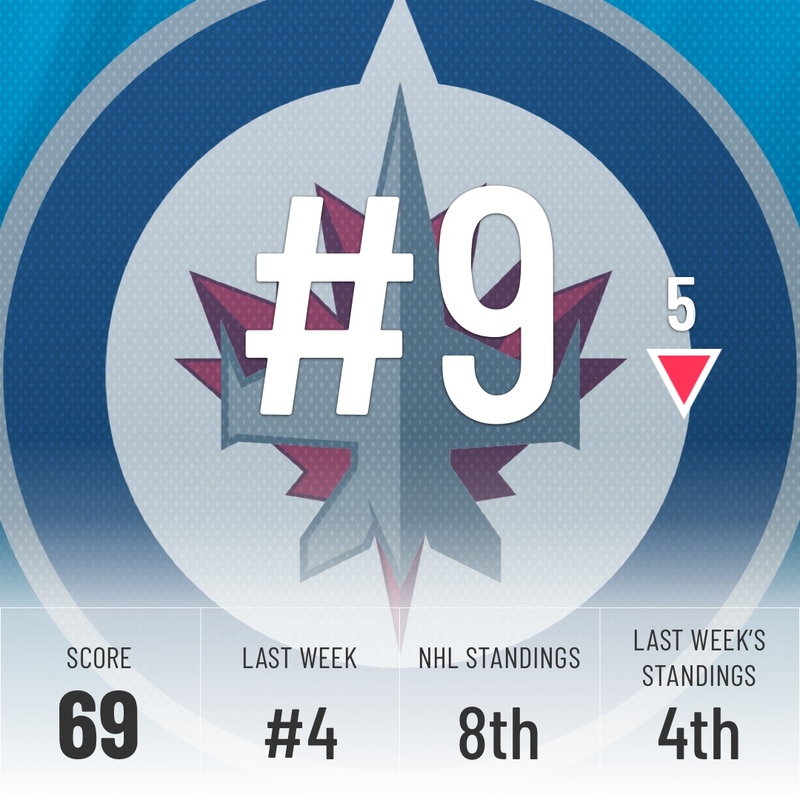 Another up and down week for the Wild and the Super Computer begrudgingly awards them with a move up one spot. 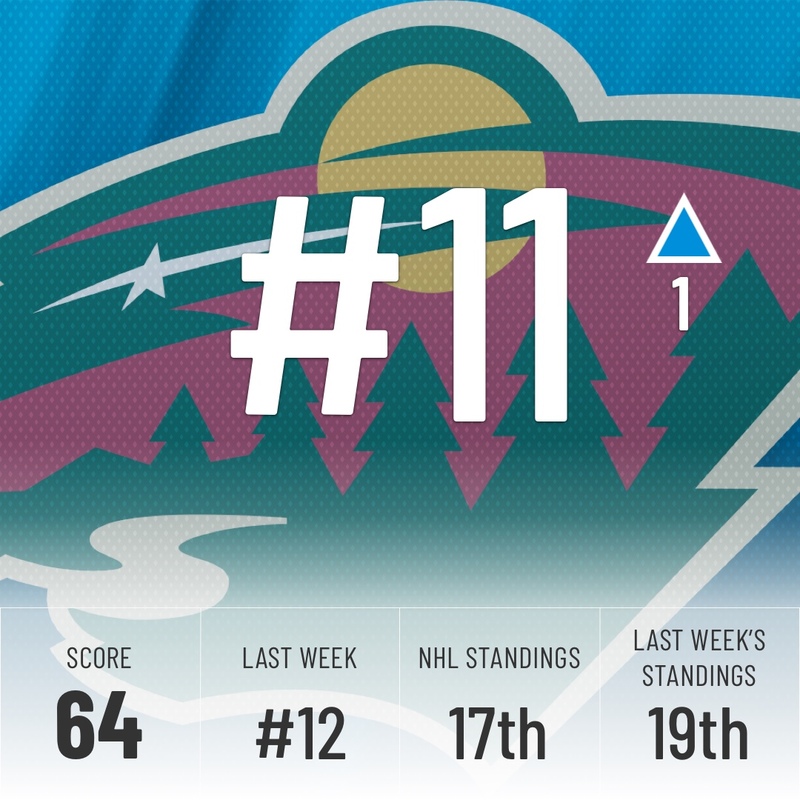 The Wild continue to hold their own, sitting in the last wildcard spot in the West. Their GM, Paul Fenton, has some big decisions to make at the trade deadline about his team’s future. 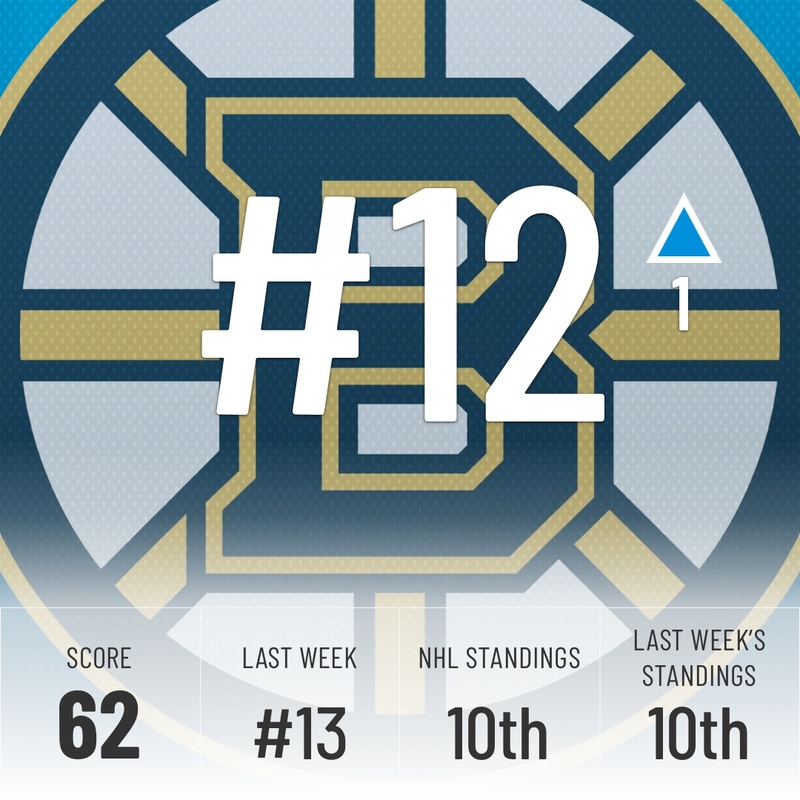 The Bruins had their five-game win streak brought to an end last night against the Capitals. That marks the 14th straight game the Bruins have lost to the Capitals. There’s a very good chance the Bruins will have to play them if they wish to make a Stanley Cup final berth so they need to figure out why they struggle so much against the Capitals. Before losing to the Lightning, the Hurricanes strung together a five-game win streak. Even more encouraging, they scored at least four goals in four of the five wins. The Super Computer’s trust in this group is finally starting to pay off and he believes they will continue to move up the standings. The Islanders continue their red-hot streak, having now won 10 of their last 12, but four straight games decided by a single goal is giving the Super Computer cold feet (cold transistors?). 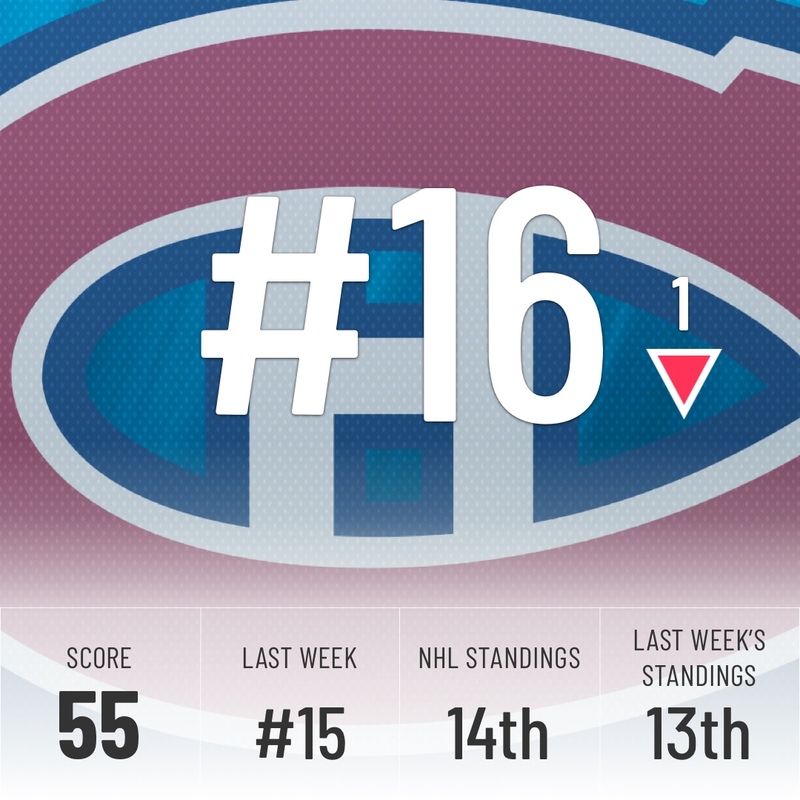 They move down to 14th, but they’ll take it if it means grabbing one of the Wild Card spots from the Canadiens. 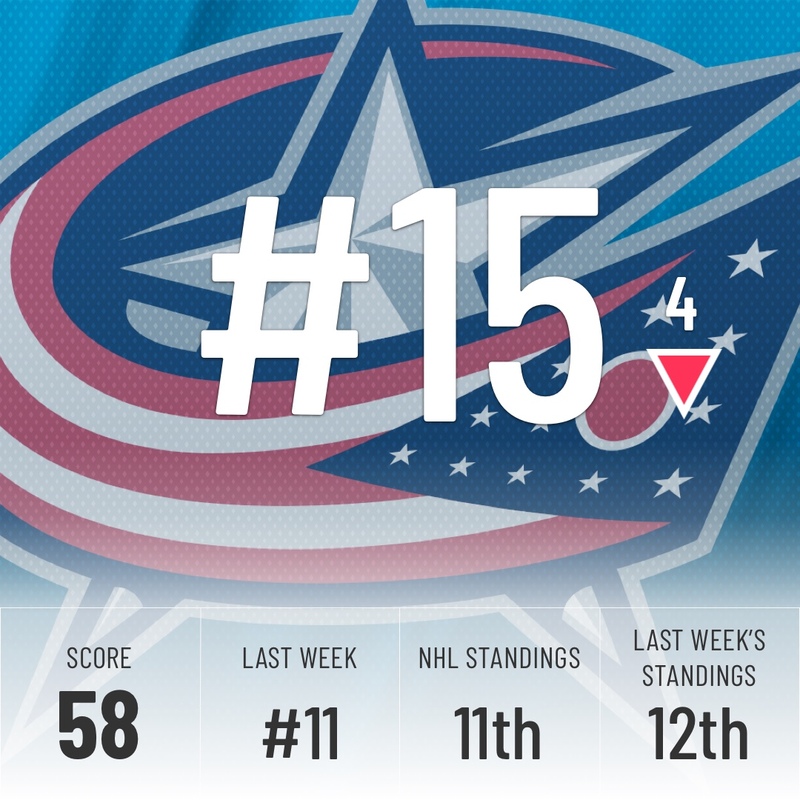 The Blue Jackets’ 2-2-0 week was overshadowed by the “Bobrovsky incident”. Here’s what we know, which isn’t very much. Sergei Bobrovsky was told to stay home by team officials after an “unspecified incident” and is set to meet with GM Jarmo Kekalainen. Kekalainen said in an official statement that “there are certain expectations and values that we have established for our players that define our culture. An incident occurred in which Sergei failed to meet those expectations and values.” Bobrovsky then missed Columbus’ game against Nashville. That’s just what Columbus needed: more questions and drama around their UFAs. Four games, but only one win against the Red Wings this week for the Habs. 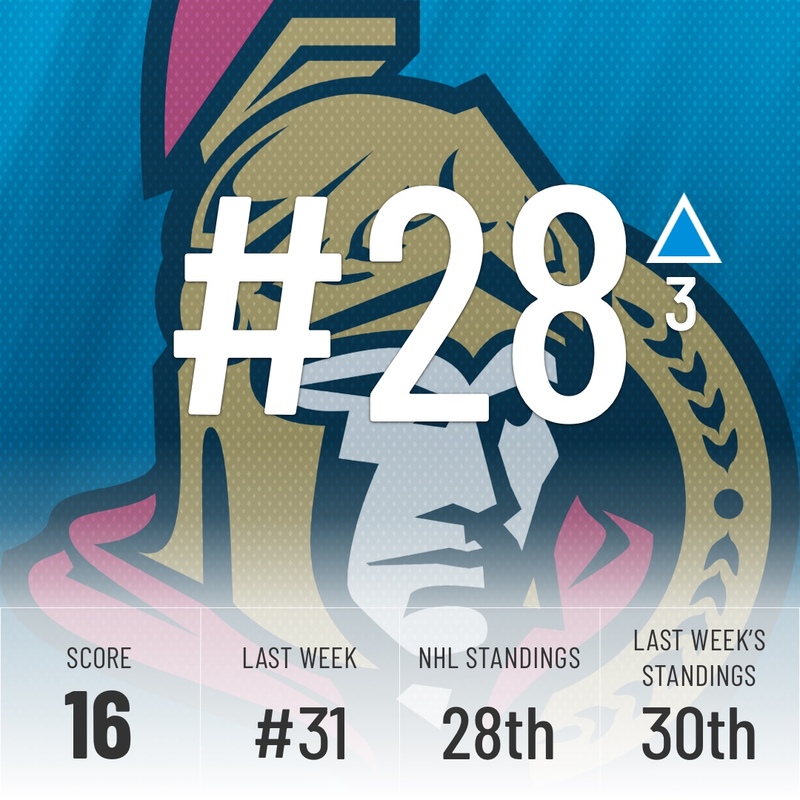 Not surprising when you powerplay goes 1-for-12 and ranks last for the season. 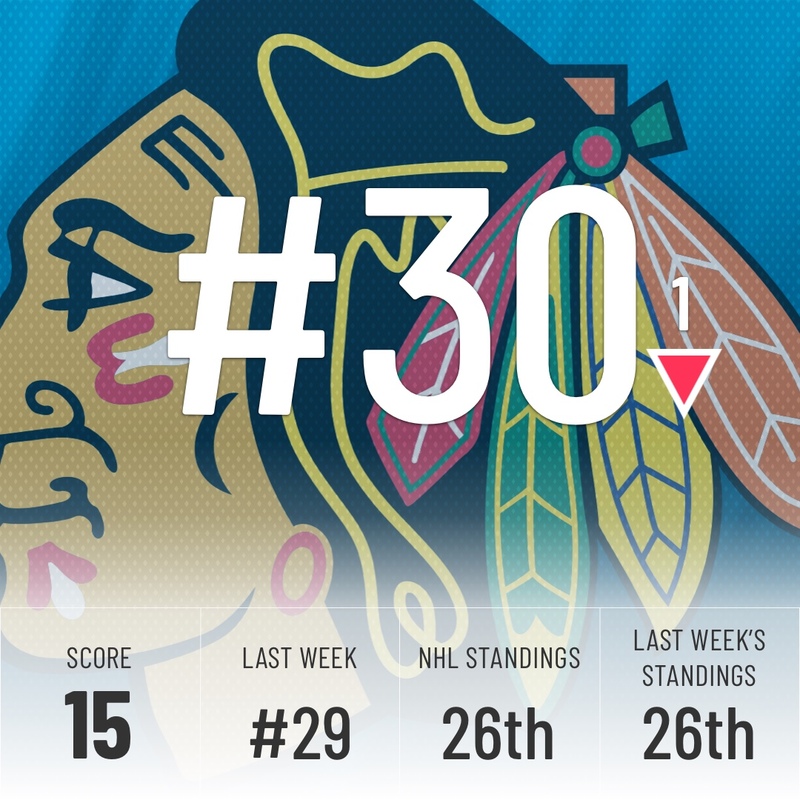 As a result, they lost their hold on the final Wild Card spot in the Eastern Conference and, more crucially, fell down one spot in these Power Rankings. 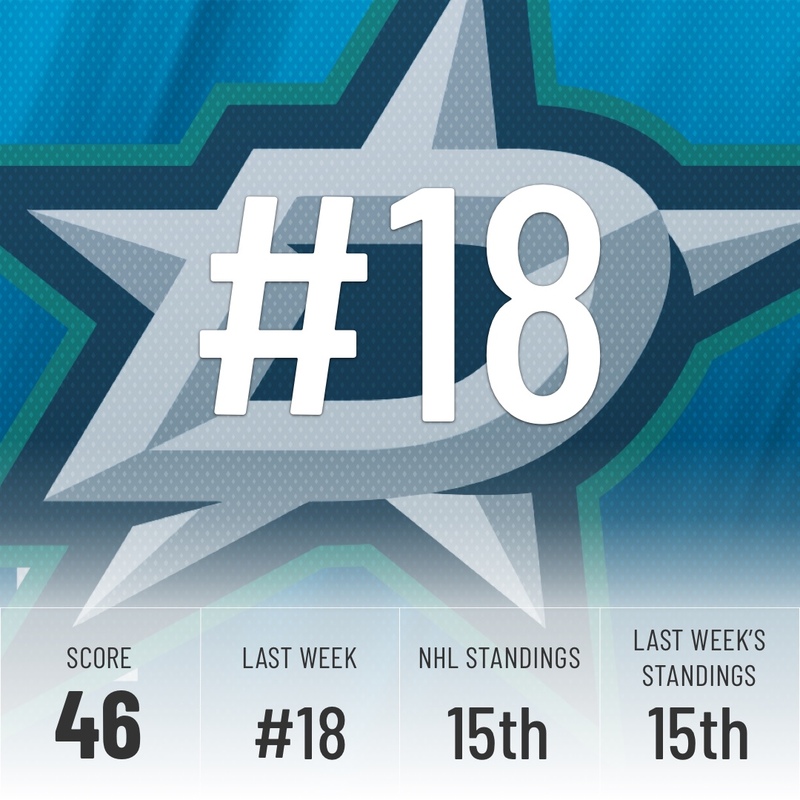 The Stars hold tight at 18th in our rankings after a 2-2-0 week and took advantage from Colorado’s cold streak to sneak into third place in the Central. Surprisingly, they’re the only team in the division to have won at least six of their last ten. 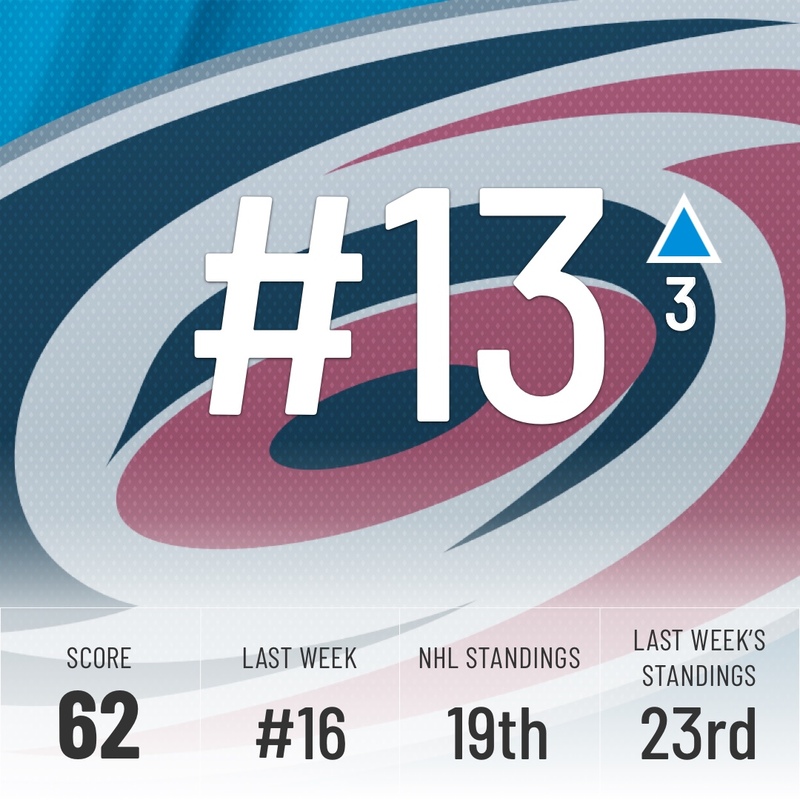 Still, the Super Computer is unimpressed by their +1 goal differential and believes they will fall back to the wildcard fight before long. Florida has yet to win a game since the calendar turned to 2019 and facing the Flames on the second half of a road back-to-back isn’t the ideal setting to snap a losing streak. They’re now ten points out of a playoff spot and look to be headed to the lottery again. 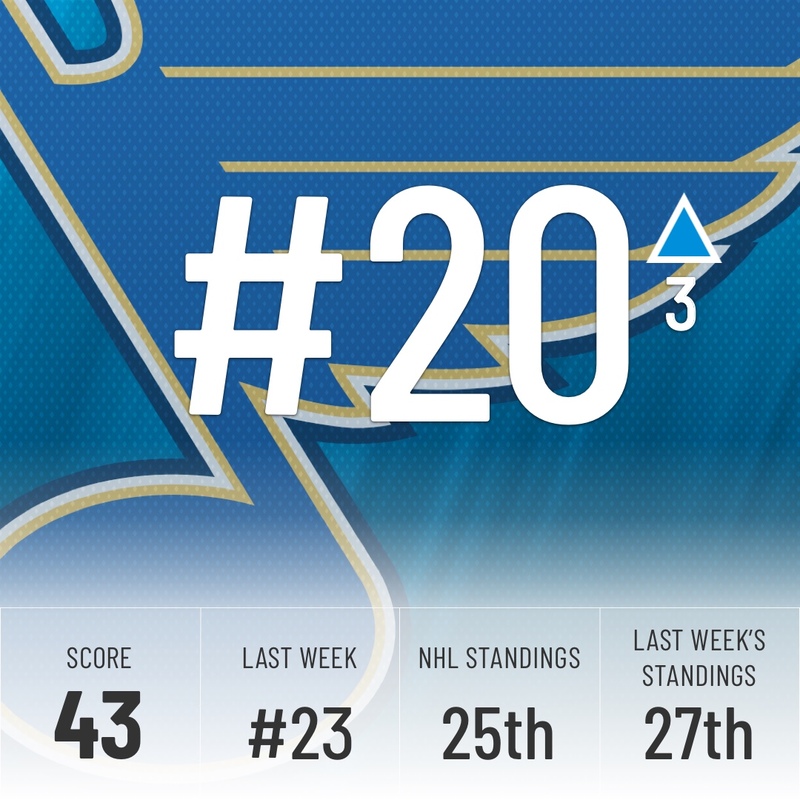 Another big bump up by the Super Computer for the Blues this week, who are slowly but surely moving up the standings. 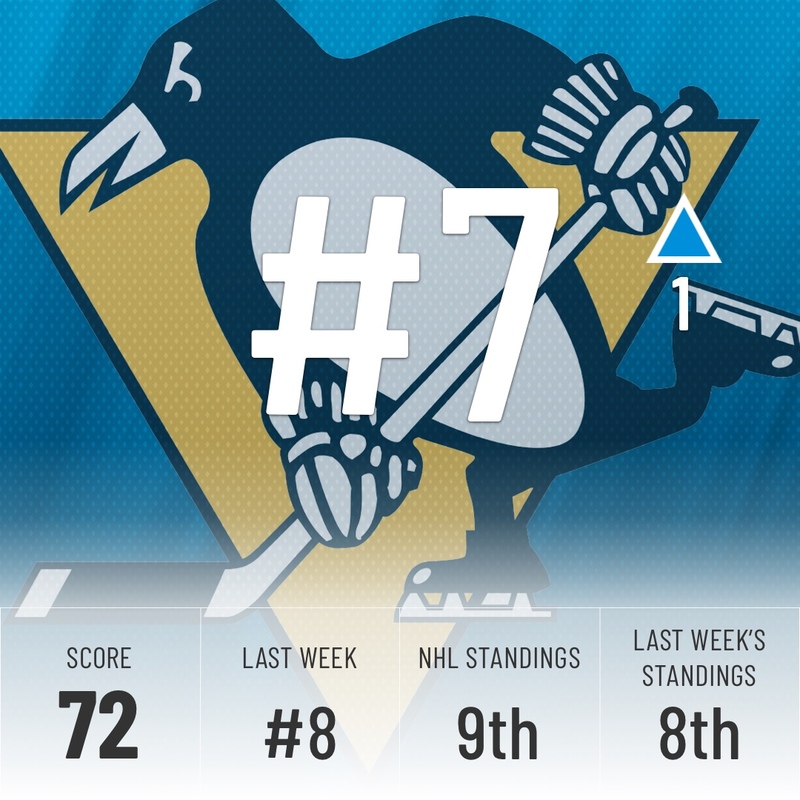 They’re currently seven points out of a wildcard spot and only face one team in the top 10 of our Rankings between now and the All-Star break. They’re still most likely going to miss the playoffs, but if there was ever a time to make a run, it’s now. We talked last week about how the Oilers win over the Coyotes would hopefully jump start them but they followed it up by getting shut out by the Kings. 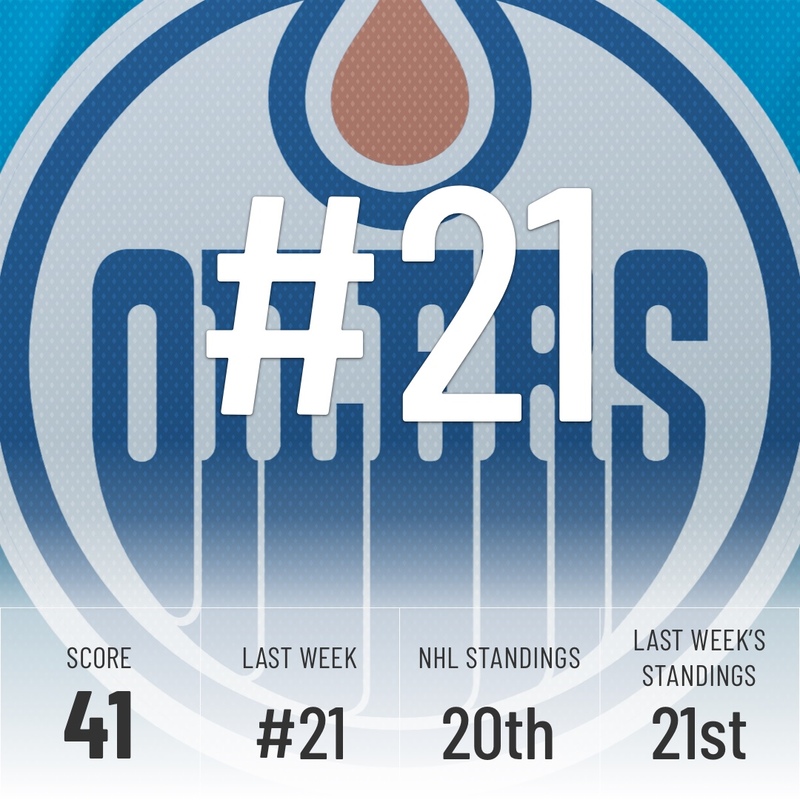 The Oilers come as advertised, if McDavid doesn’t drag his team to victory then not much happens. Hopefully, GM Peter Chiarelli can make a few moves at the trade deadline to address their needs. If not, there may be some big changes made in the offseason. In the meantime, the Super Computer doesn’t expect this team to go very far from their current standing. Taylor Hall is still out with an injury, just like Marcus Johansson, and the Devils have lost three straight. 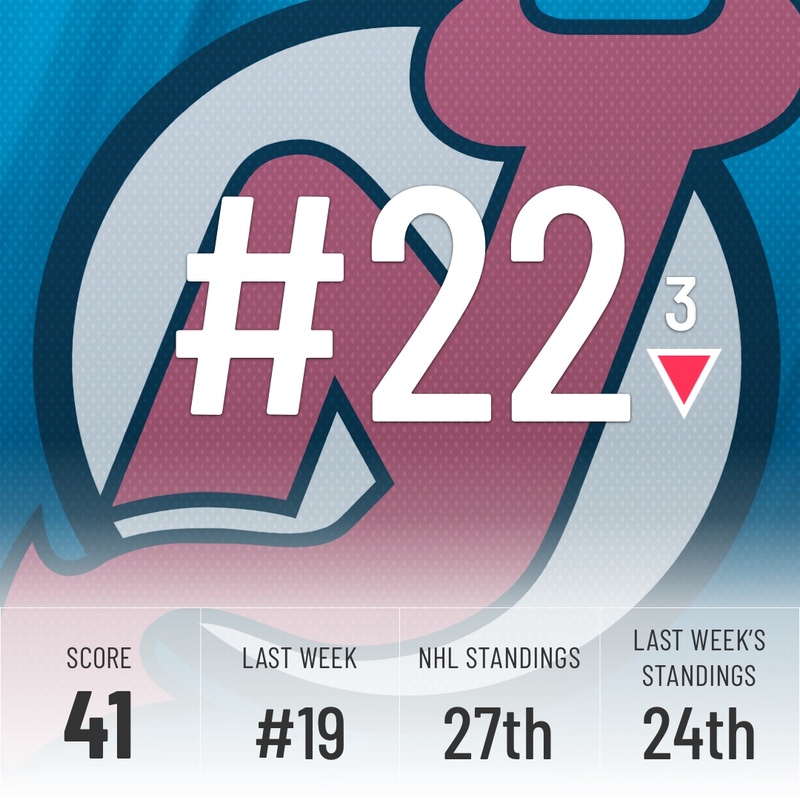 As long as they’re without the reigning MVP, don’t expect much from this Devils squad. 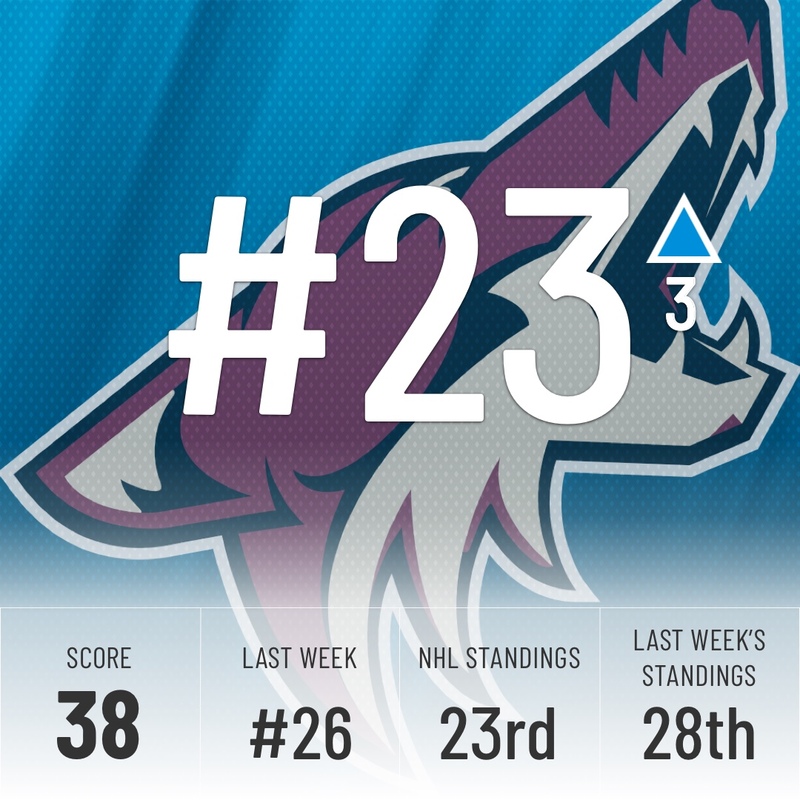 Solid week for the ‘Yotes, who move up three spots in our standings. 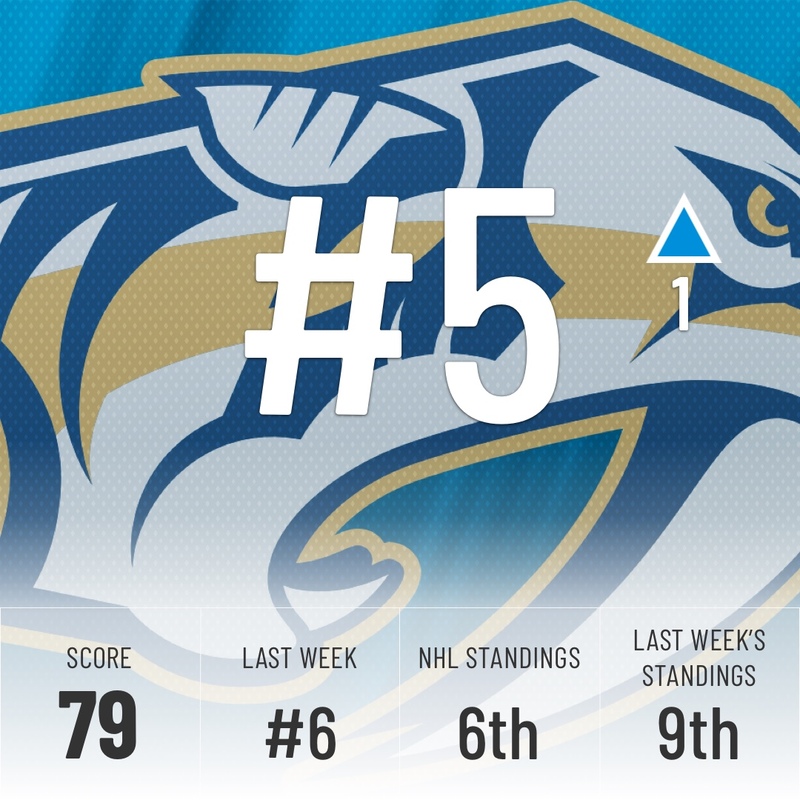 A 5-0 beatdown of the Rangers helps and so does getting five of six possible points on the week. Even after being ravaged by injuries, Arizona refuses to quit and mail it in to finish the year, a very encouraging sign for the future. 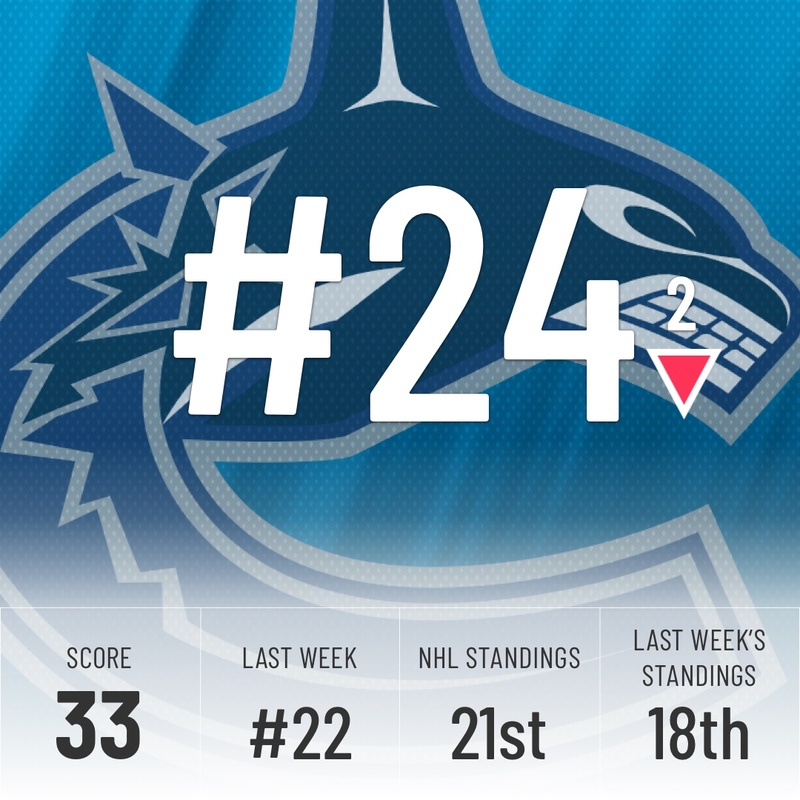 A quiet two-game week ended with two losses, but the good news is Elias Pettersson’s injury isn’t too serious. He’s expected to miss up to a couple of weeks with an MCL sprain and should come back to electrify the Vancouver crowd in no time with plays like this absolute snipe. 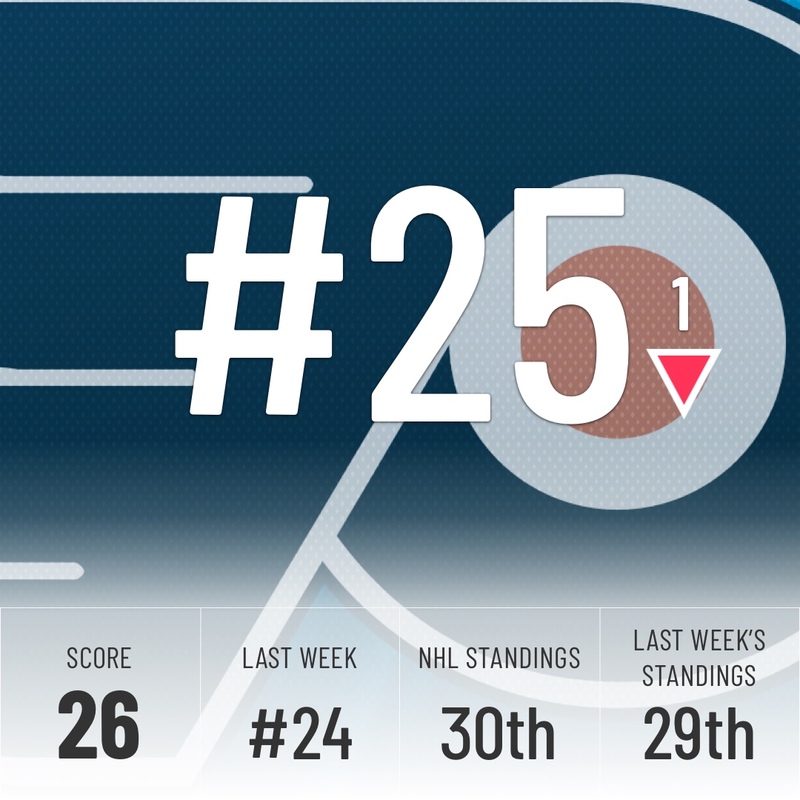 One win in four games and a -5 goal differential moves the Flyers down once again, but the Super Computer still believes they’re better than their 30th place in the standings indicates, although that’s a pretty small silver lining. Another bright spot has been the play of Wayne Simmonds, who’s really showing his worth with his name in constant trade rumors. At least Gritty continues to keep Flyers fans entertained through this tough season. Now, this is probably the Super Computer’s most puzzling decision of the season, but who are we to doubt him? 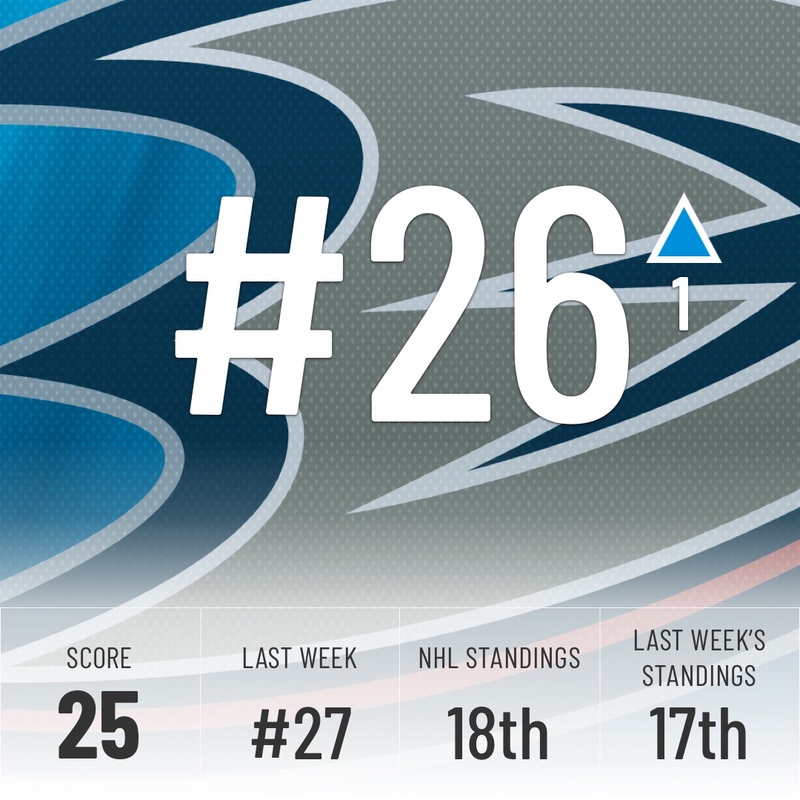 Even with a nine-game losing streak, it’s easy to forget the Ducks are still 17th in the NHL standings. As we pointed out this week, they aren’t playing massively different hockey compared to when they won 9 of 10. The Super Computer believes in this team and moves them up a spot. Oof, what a rough week in the Big Apple. They lost all four games, including 6-1 and 5-0 beatdowns to the Avalanche and Coyotes respectively. 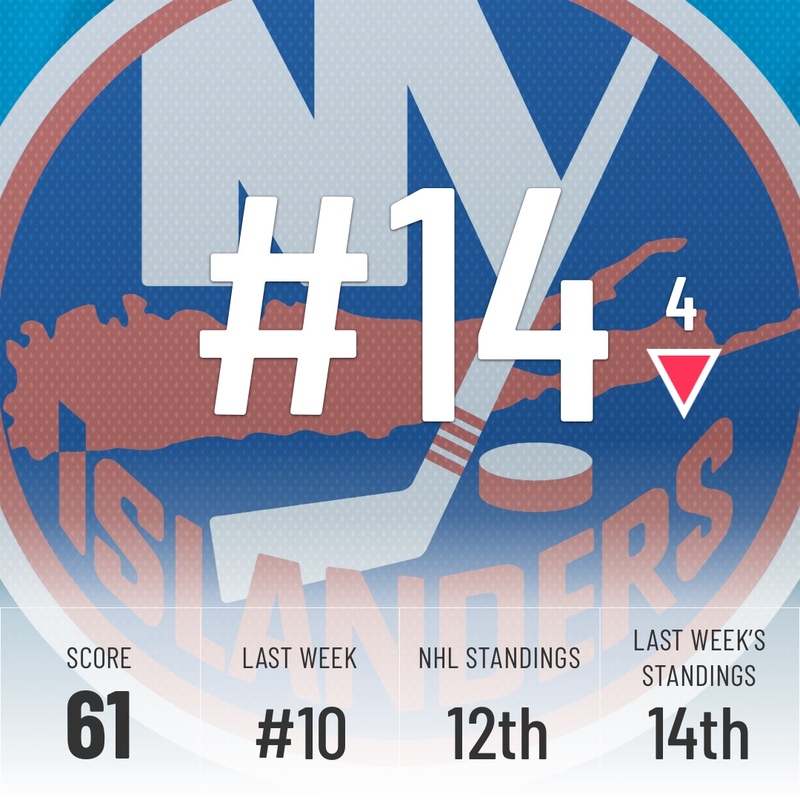 To add insult to injury, their closest loss was to their division and city rivals, the Islanders. 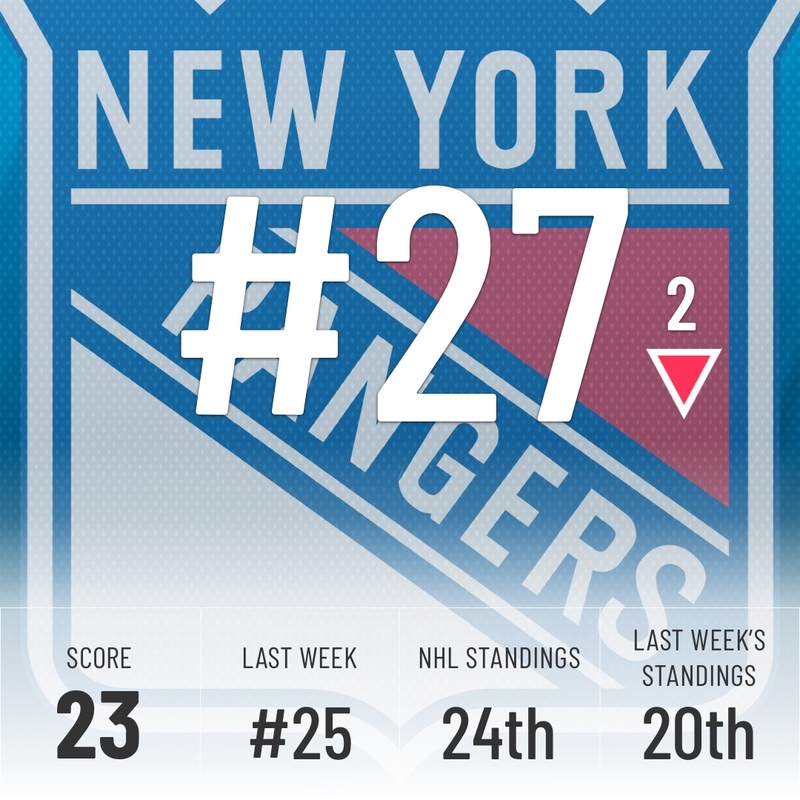 The Rangers unsurprisingly move down for the second straight week. 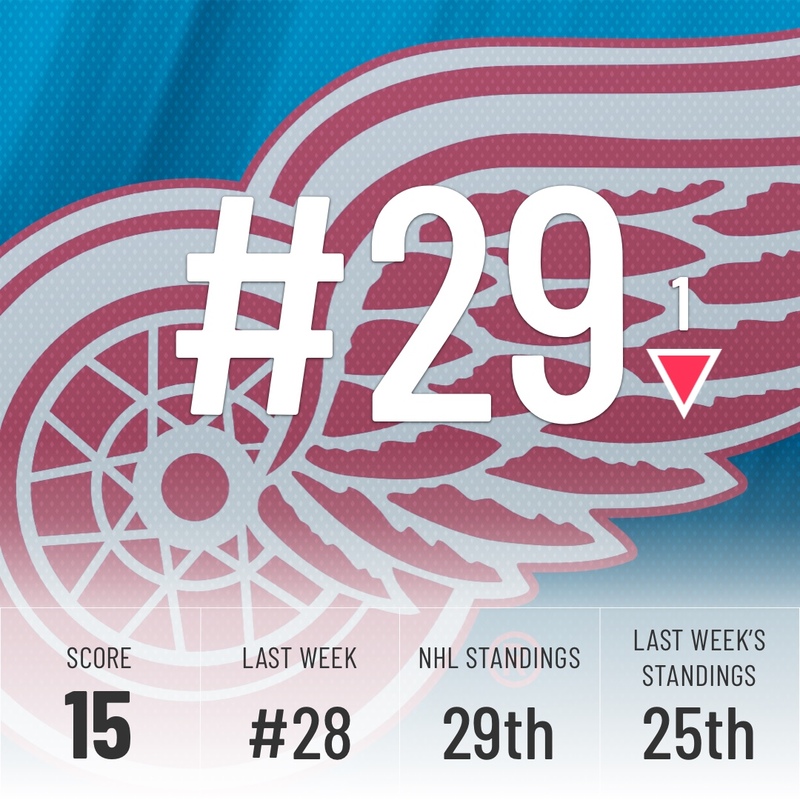 The Wings might have only won a single game in the last week, but they held up against some tough competition. They beat the Predators and stayed within a goal of both Washington and Montreal. In the end, however, that’s still just a one-win week, leaving the Super Computer unimpressed. Chicago had a very similar week to Detroit. 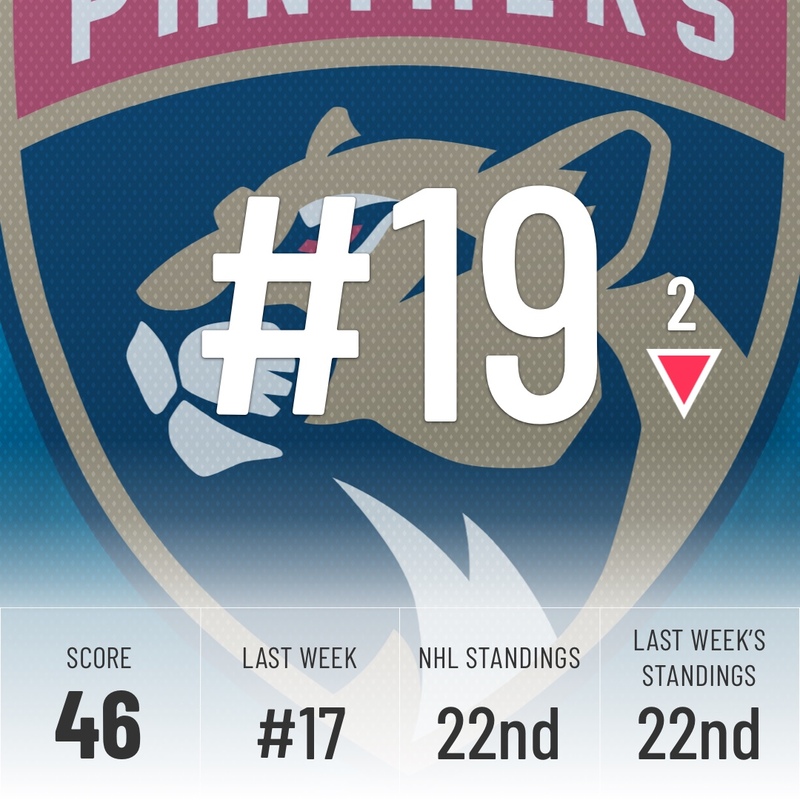 They faced three top-10 teams in our Rankings and held their own admirably, beating Pittsburgh, staying within one goal of the Flames and going to OT with the Predators, but teams around them did just a little bit better, keeping them from moving up in the standings. Next week’s schedule isn’t as intimidating, so Chicago might be making a move up soon. Keep an eye on them. 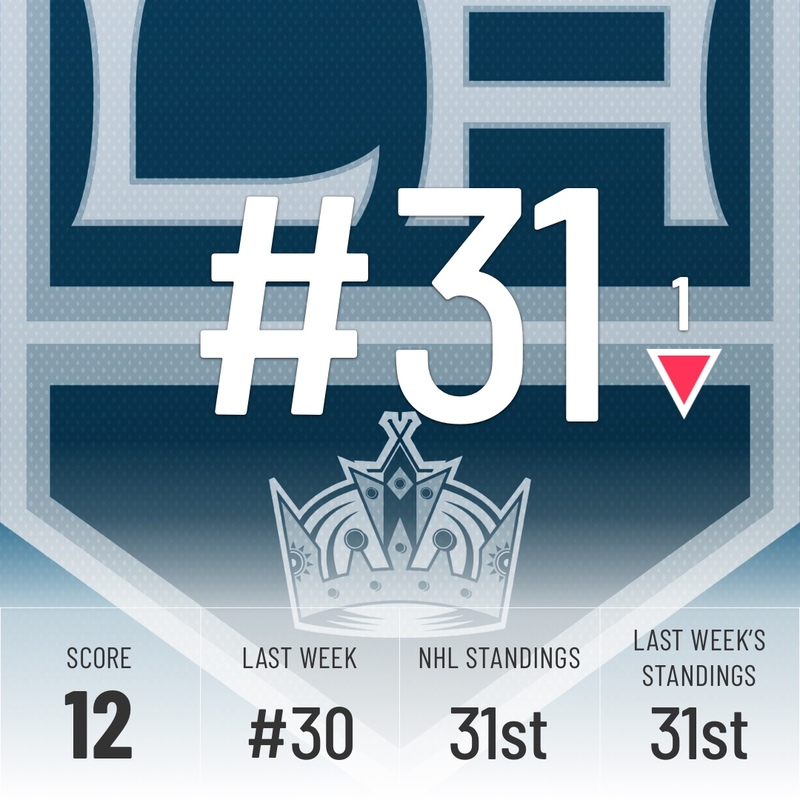 The Kings lost 4-1 to the Senators this week, whom we had at 31st in our last standings. That’s a one-way ticket to last place, a spot they’re getting pretty familiar with.